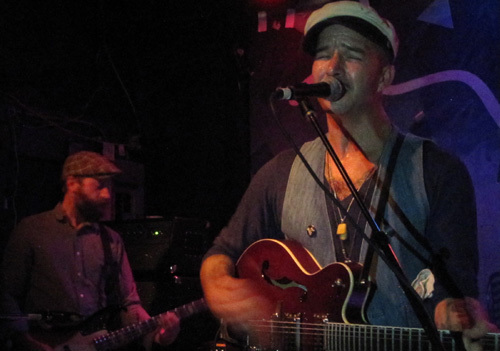 I had seen The Drowning Men on several occasions as support for The Airborne Toxic Event, mostly in larger venues. I had become so accustomed to seeing/hearing them take over the room and captive big crowds in a big space, that nothing quite prepared me for the sonic onslaught of that huge sound of theirs in the small confines of T.T. the Bear’s Place. This is a happy problem to have—being too good for a small venue. As Nato himself said, when headlining, they’re still a “small band,” though they sure as hell don’t sound like one. Org: Literati, with Jaggery, Gem Club, What Time Is It, Mr. Fox & others at Club Oberon Tomorrow night! 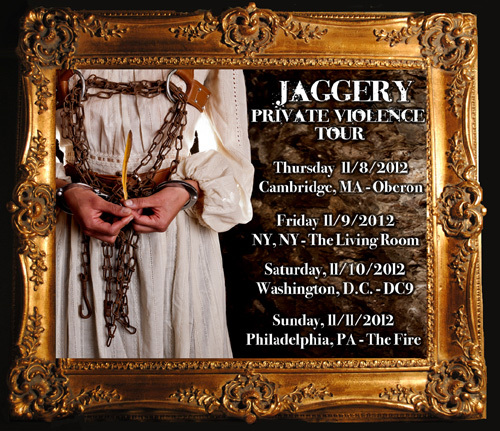 It’s a special occasion tomorrow night at Club Oberon, as Singer Mali (of Jaggery) will be hosting a rare public Org. This time the theme is literature, and a fantastic line-up of performers in various disciplines—music, poetry and prose, dance, theatre, film—will be performing works inspired by writers “from Yeats to Genet to Dostoevsky.” Jaggery will also be celebrating the release of their EP Private Violence, which is inspired by Truman Capote’s In Cold Blood. The evening will be hosted by former English professor Mika Cooper—a nice touch. Featured performers: Gem Club, What Time Is It, Mr. Fox?, Eileen Little, UnAmerika’s Sweetheart Karin Webb, Jennifer Hicks, Jaggery and live artist Kristilyn Stevenson. It is suggested that you come dressed as your favorite literary character, and that you bring a copy of your favorite book that you’re willing to part with. And Other Stories by What Time Is It, Mr. Fox? I’ve been completely remiss in covering this amazing show. 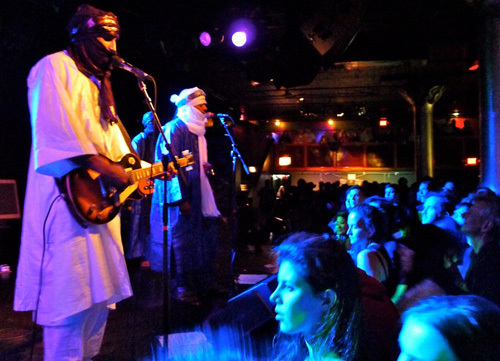 Even at this late date, I must say a few words about the Malian Tuareg-Berber musicians, Tinariwen, who performed at the Paradise Rock Club a few weeks ago. 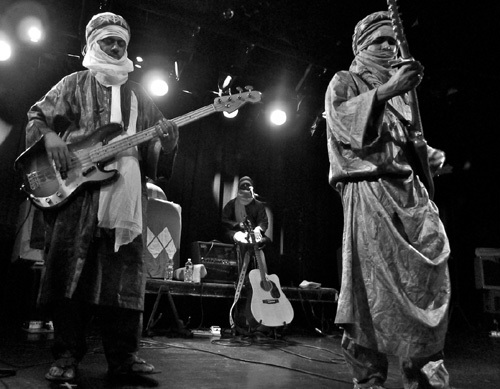 I had first become interested in Tinariwen after hearing about the recent conflict in Mali. I read a little about their history and the strong musical heritage in that region of the world. Through the struggle and perseverance of a people trying to preserve their roots, it is a culture that has inspired musicians such as Ali Farka Touré and Amadou & Mariam. Tinariwen was formed in Libyan refugee camps after the members had fled their war-torn homeland of Mali. Their sound, while strongly influenced by the guitar-based rock of Western artists such as Jimi Hendrix and Carlos Santana, has deep roots in Malian traditional music. 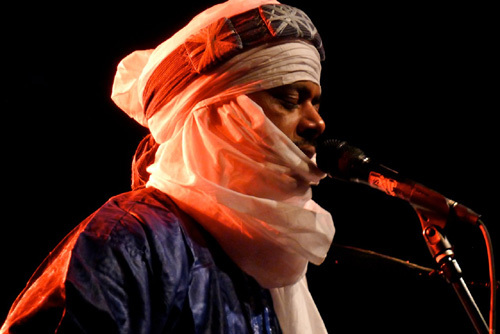 At the Paradise, performing in their traditional dress of the Sahara Desert area of Mali and singing in the Tamashek language of the region, Tinariwen very quickly brought the audience under their spell. The instrumentation was simple—acoustic and electric guitars, bass, a single African drum and occasional flute. But the intricate weaving of music and vocals was deeply emotional and absolutely hypnotic. From the truly phenomenal guitar playing to the trance inducing drumming and audience clapping, and then the chant-like vocals, this was a religious experience of epic proportions. The singing is poignant in their native language, particularly if you’re aware of the heartfelt lyrics that are being sung. What struck me especially, knowing of their origins in refugee and military training camps in Libya and Algeria, is how incredibly soulful and, well, loving these guys were. They are so humble, so deeply appreciative of their audience, and put across such a feeling of peacefulness and warmth, that I was completely blown away. They had a deeply spiritual vibe and went off on such astonishing ‘space jams,’ it was like The Grateful Dead took a long trip through the Sahara Desert. Totally captivating. You do not miss these guys when they (hopefully) come around again. The Boston-based Atlas Soul, with their North African funk/jazz/rock/hip-hop, singing in multiple languages, were the perfect support for Tinariwen. They were also wonderful.